PHILADELPHIA (WPVI) -- Jake Arrieta flashed the All-Star form that made Philadelphia covet the free-agent ace, striking out 10 and tossing one-hit ball over seven innings to lead the Phillies to a 7-0 win over the Pittsburgh Pirates on Thursday night. Arrieta struck out seven through the first four innings - he had struck out only six over 10 2/3 innings in his first two starts. He wore short sleeves on a night when temperatures dipped into the 30s. The postseason flags whipping in the wind were about the only things with more movement than Arrieta's fastball. He had a unique look in this one. 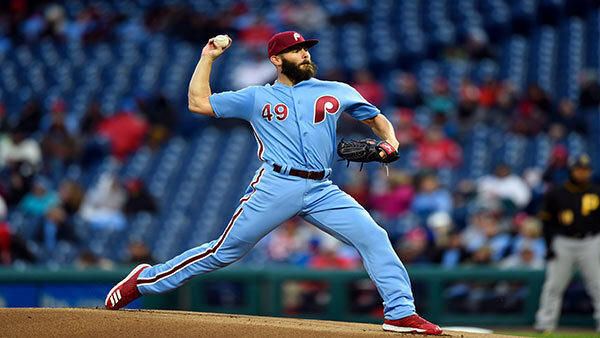 The Phillies wore powder blue 1970s and '80s uniforms that seemed fitting for Arrieta's throwback outing. The Phillies haven't had a winning season since 2011, when they won their fifth straight NL East title. The addition of Arrieta signaled a long, arduous rebuilding process could turn into contention this season. They've already had a six-game winning streak - the last three on a sweep at Tampa Bay. Arrieta was on from the start, striking out Adam Frazier and Gregory Polanco to open the game on a pair of 94 mph sinkers. He allowed only an infield single in the second inning. Hoskins lined his third homer of the season to left and Hernandez made it 4-0 on a bases-loaded single to left off Jameson Taillon (2-1). Taillon allowed five runs and was chased after 1 1/3 innings. Yacksel Rios and Victor Arano each tossed a scoreless inning in relief to complete the shutout. Pirates: RHP Joe Musgrove, on the disabled list with strained muscle in his right shoulder, threw a bullpen session and will throw another on Sunday. Phillies: RHP Tommy Hunter is set for a rehab outing with Double-A Reading on Friday. Hunter has been out all season with a hamstring injury. "I think he profiles as a guy that can give us one-plus (innings)," Kapler said. "On some days, he might come in for a couple of batters. On others, he might go a little bit longer for us." The Pirates held their annual "Dads' Trip" series this weekend in Philadelphia. The fathers of 20 players and staff members attended the series and took part in various baseball activities with their kids. Kapler wasn't much of a Phillies fan growing up, but his dog Pete was named after one of his favorite players: Pete Rose. "Little black mutt terrier," Kapler said. "He always bet on himself." Pirates: RHP Ivan Nova (2-1, 4.88 ERA) tries to win his third straight start. He has a 2-1 career mark against the Phillies and struck out 11 batters in one start against them in 2006. Phillies: RHP Ben Lively (0-1, 5.87) makes his fourth start for the Phillies.